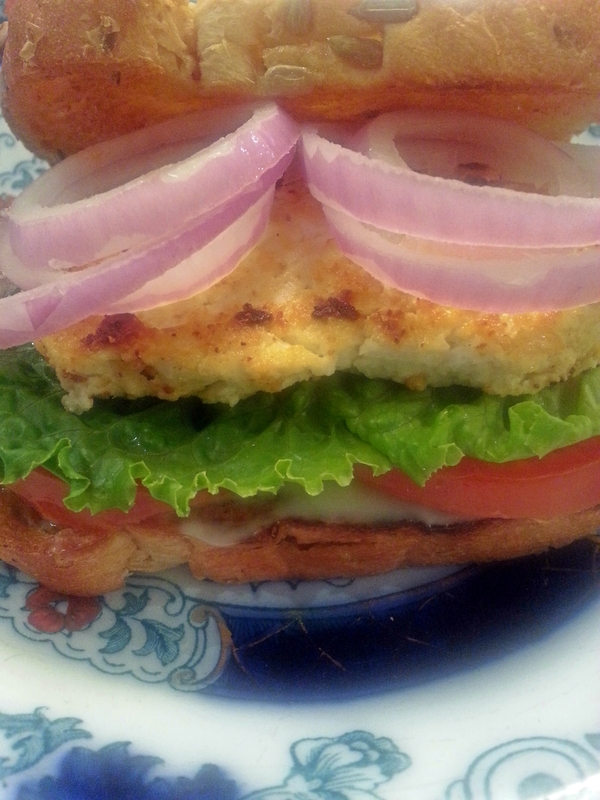 My kids love this sandwich and i make it quite often as it is really simple and fast to make. 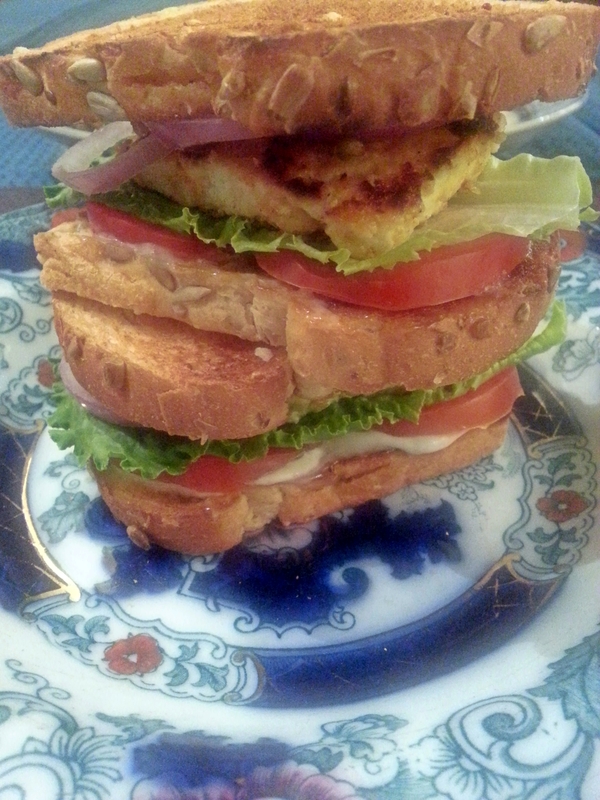 This is an Indian vegetarian BLT! The paneer is grilled in a spicy marinade which adds a lot of flavour to it. The sandwich is very moreish, it is spicy, crunchy and delicious. If you want you can add some greek yogurt and a few teaspoons of milk to your mayonnaise with a dash of lemon for extra flavour. A fresh, tasty, quick and wholesome meal that is how we like it here. Stir together the yogurt, ginger, garlic, ground spices, lemon juice, and oil and salt in a bowl. Place the paneer in the marinade and leave for at least half an hour. Put a piece of foil on a grill tray and turn the grill to high. Arrange the panner slices on the rack and grill for 10 minutes, turning once or twice or until the edges are charring. Meanwhile toast the bread, spread mayo over one piece of toast, place an even layer of tomato slices, then lettuce. 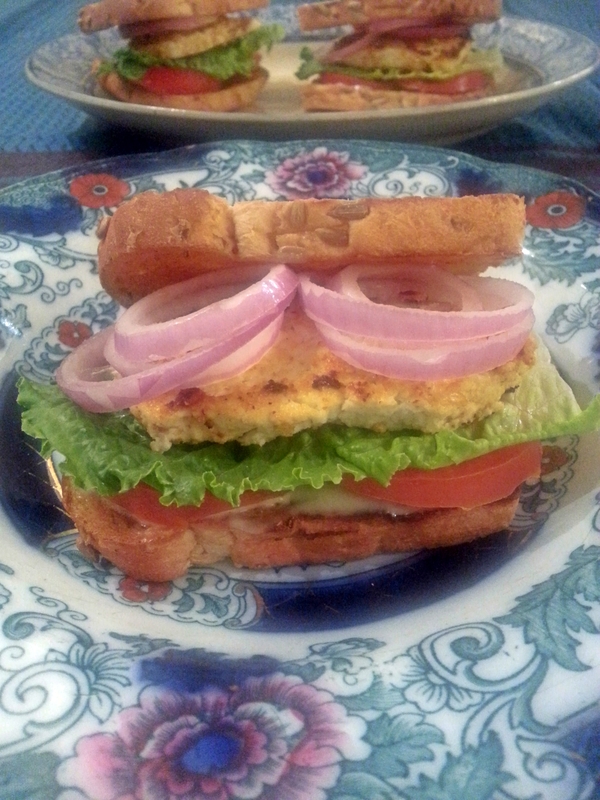 Top with the grilled paneer, add the onion rings then the toast. Serve immediately. Recipe slightly adapted from Indian vegetarian feast. Wow, I love this idea! I absolutely love paneer in every form, even just plain paneer, and I bet it tastes even better after it’s been in your marinade!